A fascinating graphic and the article it is pulled from. 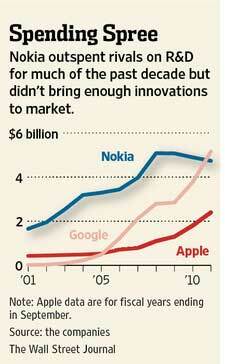 Nokia led the wireless revolution in the 1990s and set its sights on ushering the world into the era of smartphones. Now that the smartphone era has arrived, the company is racing to roll out competitive products as its stock price collapses and thousands of employees lose their jobs. This year, Nokia ended a 14-year-run as the world’s largest maker of mobile phones, as rival Samsung Electronics Co. took the top spot and makers of cheaper phones ate into Nokia’s sales volumes. Nokia is losing ground despite spending $40 billion on research and development over the past decade—nearly four times what Apple spent in the same period. Instead of producing hit devices or software, the binge of spending has left the company with at least two abandoned operating systems and a pile of patents that analysts now say are worth around $6 billion, the bulk of the value of the entire company.